Be sure to read the back of the seed pack, prior to planting. Most warm weather veggie seeds are started 6-8 weeks before the last frost date (May 10th). Cool season veggies can be started indoors 4-8 weeks before April transplanting. 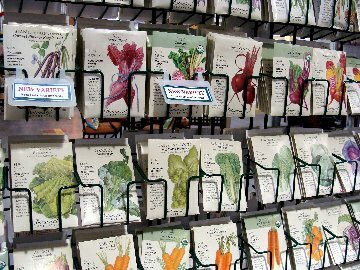 To start seeds indoors, purchase “starting soil”. Regular “dirt” from outside does not work well for starting seeds inside. Use hot water to moisten the mix in the bag. Place soil in egg cartons or plastic trays. Scatter seeds evenly over the surface or in rows. Some seeds need to be lightly covered with the mix to germinate, others do not. Check on the package to see if your seeds have any special requirements when you sow them. You’ll want to keep your soil evenly moist, but not wet and waterlogged, until the seeds have sprouted. Loosely cover your containers with a clear plastic wrap to hold moisture until the seeds sprout. After the seedlings have two sets of leaves, set them in direct sunlight and thin them so that good strong plants develop. For seedlings already in pots: As the seedlings develop their first set of true leaves, begin thinning out the smaller plants, keeping the largest, healthiest seedlings. Do so by pinching off the stems at soil level so you don’t disturb the plants you keep. For seedlings in flats: Carefully dig up the little seedlings and put them in larger pots (Peat pots are ideal for this). Use the same moist seeding mix to fill the pots as you used in the seed flat. Feed plants if they become pale. This will keep the plants dark green and healthy. As the seedlings grow and the temperatures rise, the plants need to be acclimated to outdoor temperatures as it gets closer to the frost-free date. Place the plants outside in a semi-shady, protected spot during warm days (60’s and above) and bring back in during the cooler evenings. After a week or two of acclimation and after the frost-free date (for warm weather veggies), the plants will be ready to transplant.